The reality of the kokanee salmon spawn was a far different scene than I had imagined. In retrospect I suppose that I had not really thought this through. I imagined the brightly colored fish valiantly making their way up-stream to lay eggs that would hatch in the spring. 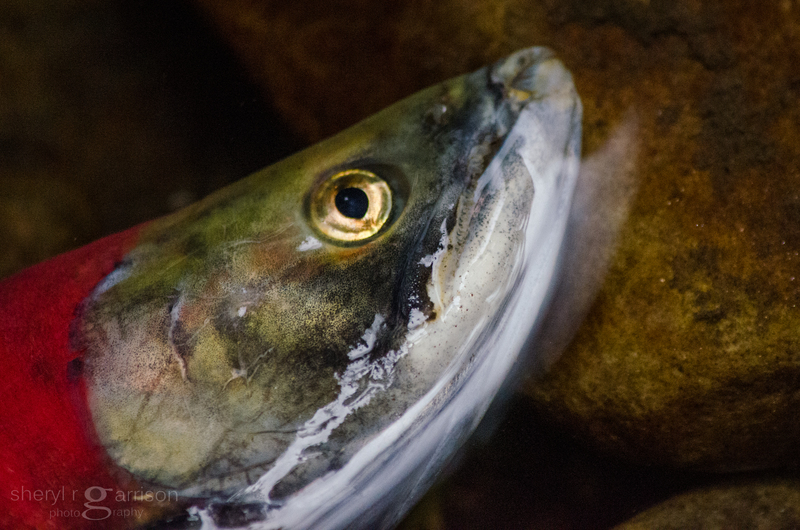 The kokanee is the landlocked version of the sockeye salmon and they spend their entire lives in fresh water. It was magical really seeing them twist and flip, powering their way upstream against a fairly strong flow of water. They glistened and shone with eye-popping color, ranging from strong pinks to deep reds but retaining the dark green head. I wandered along the edge of the creek armed with bear spray in the event that one should make a sudden, not to be avoided appearance. The sound of the rushing water eliminated the possibility of hearing a bear in advance so I alternated taking shots with taking full scans of the area around me. I knew that the kokanee died after spawning and there were bodies in various stages of decay beginning to gather at the edges. As I moved in to photograph one such body; tail and fins tattered and gouges scraped down through the skin and into the flesh on his sides, I watched in horror as he tried to draw a breath. It was then that I realized that this was not an isolated case. All around me were fish hanging on by a thread in bodies that barely functioned; where death would be a blessing. And so I began to photograph them…these warriors that had conquered the arduous trip upstream to spawn. 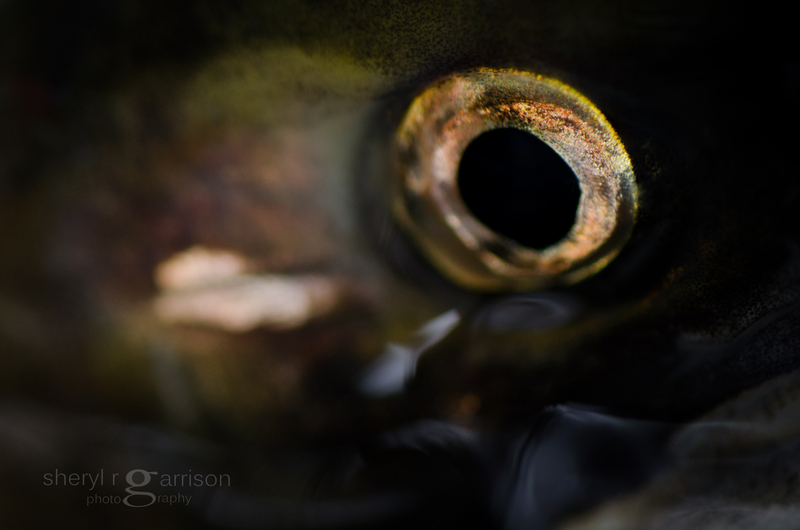 Did I set out to photograph dead and dying kokanee? Most assuredly not but I recognized that this was a moment, an opportunity that shouldn’t be dismissed, and in finding a way to create beauty amongst the carnage I was able to have some measure of peace with the reality of nature’s cycle of life. Not always pretty, not always kind, but always consistent in the eventuality of death. Prints and additional images from this series are available in gallery idaho…finned by clicking on this link to my website . It amazes me how you are able to find beauty in what most of us would find a horrible experience. Your words and pictures are inspiring. An encounter of a different kind! You have certainly translated their last struggle into pictures of ephemeral beauty (and green and red – so divine!). What a great experience, your observations are inspiring. A memorable sight & lovely images.